Henley Rowing Club took nine victories from 2 events over the weekend with tremendous senior and junior performances at Burway Small Boats Head and Wallingford Head of the River. On Saturday, the senior women took a brace of wins in the Women’s IM2 singles and doubles events. 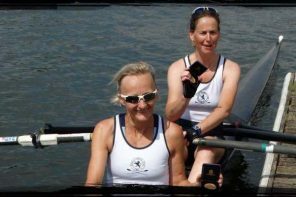 Victoria Carver won in the single scull ahead of Globe Rowing Club, and then formed a double partnership with Lizzie Williams to score another victory over Globe. In the junior events, the WJ15 coxed quad of Libby Sims, Gemma Sarney, Grace Johnson, Alice Jones and cox Freya Reid won the head race some ten seconds ahead of Abingdon Rowing Club. The women’s WJ14 coxed quads held the first 3 positions out of a field of 17 eligible crews. 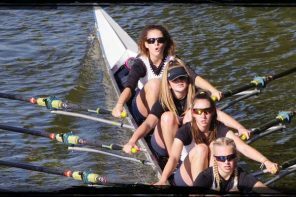 The winning crew of Jess Arlett, Felicity Parfitt, Sophia Hahn, Livia Petersen and cox Emilene Warner won by 20 seconds. The J14 coxed quad of Oliver Taylor, Henry Peters, Tom Crook, Jack Spiers and Joe Edwards as cox tied with Marlow for first place. Tom Crook then went on to win the J14 single sculls against a field of 6 other crews. On Sunday, the Henley Junior and Senior women raced the 4250m Wallingford Head of the River. In the morning division, the Henley Junior Women crew of Lauren Kay, Lily Stimpson, Florence Wiggins, Maisie Turner, Clare Pearson, Georgia Edwards, Ella Morgan, Emma Lister and cox Rebecca Lister won the WJ18 eight event convincingly in a time of 17 minutes and 35 seconds, ahead of St Georges College in second place. Remarkably, this crew with a change at stroke with Anna Roe replacing Emma Lister, and Lister taking the cox’s seat, then raced in the WJ16 eights event in the afternoon and again won in commanding fashion ahead of second place crew Lady Eleanor Holles School Boat Club. The coxed four of Alicia Redman, Ella Wandless, Katy Claridge, Iona McNab and cox Anna Roe raced into second place in the WJ16 event in the morning division. This crew, with Freya Reid as cox, then raced in the Womens IM2 event in the afternoon division and won, beating a much older university crew from Christ Church College. The Henley senior and junior women’s squads raced together in an IM1 eight. 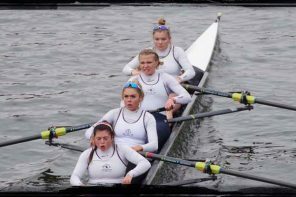 The crew of Ellie Thompson, Lottie Orr, Lauren Edwards, Rachael Alder, Sophie Reynolds, Alexis Perkins, Cat Kay, Hattie Orr and cox Rebecca Lister came second in their event, behind the crew from Oxford Brookes University and ahead of third placed Headington School.